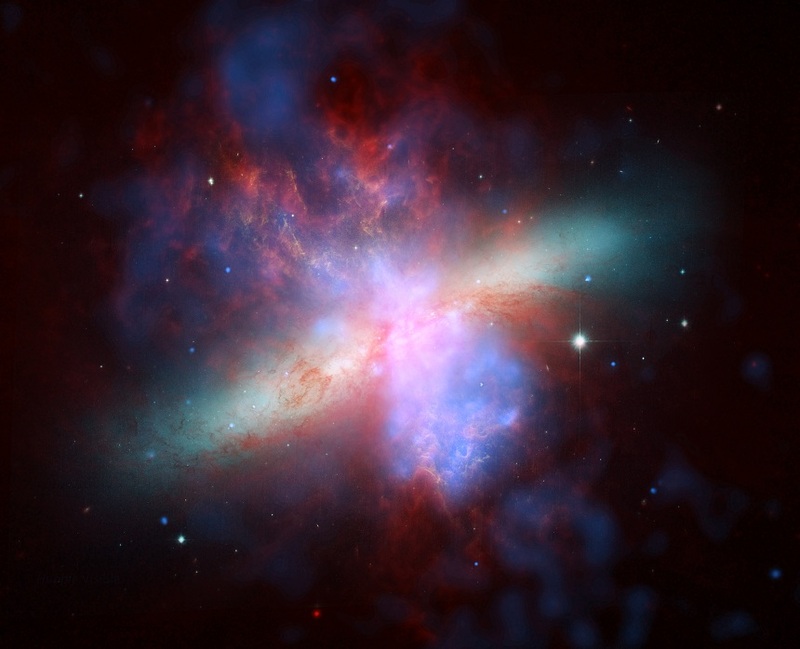 Cosmological Arguments | J.W. Wartick -"Always Have a Reason"
[I]t seems impossible to disprove, a priori, the possibility of an infinite past time. -J.L. Mackie, The Miracle of Theism, 93. I wrote recently about several objections to the Kalam Cosmological Argument, but I wasn’t able to cover even the most common objections in one post. Here, I’ll examine a few more objections to the argument, as well as offer critiques and more links to read. A common objection to the Kalam Cosmological Argument (hereafter KCA or Kalam) is against its principles of causation. The atheist points out the principle of the conservation of energy: that energy can be neither created nor destroyed, but only change forms (it can equally be said that “matter can be neither created nor destroyed…”). Applying this to the Kalam, they argue that because the KCA asserts the universe began and was caused, it cannot be true–matter cannot come into existence. Second, using the conservation of energy to argue against the beginning of the universe reveals confusion about cosmology to begin with. Scientists can extrapolate back to the beginning of the big bang–which is the moment when both space and time came into existence, along with all of the material world (Craig and Copan, cited below, 222ff). So we know scientifically that there was a moment when there was no matter at all. It was created, not out of other matter, but out of nothing. Here is the key to note: it is once the universe came into existence that the laws of nature came into effect–before the universe, there was nothing. Third, if it is true that matter has never been created or destroyed, matter and energy would be eternal. But if that is the case, then due to another law of thermodynamics–entropy–the entire universe would have evened out all the energy by now. There would be no stars burning, no people breathing, etc. Thus, it is easy to see scientifically that the universe is not eternal. The late atheistic philosopher J.L. Mackie objected to the Kalam from a different perspective. He felt that there was a problem with the way William Lane Craig tried to establish a finite past. He argues that “[The Kalam] assumes that, even if past time were infinite, there would still have been a starting-point of time, but one infinitely remote, so that an actual infinity would have had to be traversed to reach the present from there. But to take the hypothesis of infinity seriously would be to suppose that there was no starting-point…” (Mackie, 93, cited below). William Lane Craig and Paul Copan point out that, “On the contrary, the beginningless character of the series of past events only serves to underscore the difficulty of its formation by successive addition. The fact that there is no beginning at all, not even an infinitely distant one, makes the problem worse, not better” (Craig and Copan, 214, cited below). It’s not that defenders of the Kalam argue that if the past is infinite, one could not count to the present–rather, it’s that if the past is literally infinite, there is no beginning, and one could never reach the present moment by successive addition. If one finds this line of reasoning unconvincing, however, one must also deal with the empirical problem with an infinite past: entropy. If the universe has existed forever, then all the energy in the universe should have evened out by now. We would simply not observe the universe we do. Thus, both philosophically and scientifically, we can discount the idea of an infinite past. I addressed the multiverse in my previous post on the topic, but it should be noted how much of a difficulty there is for those wishing to use the multiverse to discredit the Kalam. Jeffrey Zweerink points out that according to Arvind Borde, Alexander Vilenkin, and Alan Guth, “any cosmos that expands on average (like an inflationary multiverse) must have a beginning in the finite past” (Zweerink, 32, cited below). The multiverse does not help those trying to avoid a beginning for the universe, it merely pushes the problem up one level. Again, after subjecting the Kalam Cosmological Argument to multiple objections, it emerges unscathed. It establishes its conclusion: the universe has a cause. What does this mean? That’s a question we should all consider of utmost importance. An outline of the Kalam Cosmological Argument. Dawkins and Oppy vs. Theism: Defending the Kalam Cosmological Argument– A survey of some philosophical and popular attacks on the KCA along with rebuttals. William Lane Craig and Paul Copan,Creation out of Nothing (Grand Rapids, MI: Baker, 2004). J.L. Mackie, The Miracle of Theism (New York, NY: Oxford, 1982). Ways around these difficulties have been proposed. For example, regarding entropy, some have argued that perhaps different laws of nature apply to the multiverse as a whole. Clearly, this is an extremely ad hoc theory that is really only invented to try to get around the argument. Once we’re allowed to modify reality to our every whim, we could indeed create anything we like–including (nearly) infinite universes. Another problem with the multiverse objection is that we have startlingly little evidence for such a hypothesis. While there are many hypothetical scientists proposing bubble universes and the like, it’s shocking to read just how little evidence there really is for such a hypothesis. Finally, even were there an infinite multiverse–as some have proposed due to string theory–this would not avoid an absolute beginning for the entirety of the multiverse. Bruce Gordon points out that the standard inflationary models still use inflation with a finite duration, which would entail that regardless of the number of universes which exist, there would still have to be an absolute beginning to the multiverse (Gordon, cited below, 86-87). Perhaps, however, this multiverse (or the universe) is finite, but it created itself. There are a number of proposals suggesting just that. Stephen Hawking [who recently proposed the universe created itself] falls into this dilemma by claiming that the universe was created as a result of quantum mechanical fluctuations (in a vacuum) which became stabilized by gravitational forces [Hawking pp. 131-135; Hawking review]. He thus requires the laws of quantum mechanics and of gravity to have pre-existed the universe… But what is the law of gravity but a description of the way materialbodies interact — either with one another or with the space-time continuum? To claim that such a law existed in the absence of matter, energy, space or time stretches credulity and is incapable of demonstration. Only ‘mind of God’ and ‘non-material blueprint’ arguments remain and these are theological not scientific. Similarly, suppose we took the claim of Smith (above) seriously–that the universe created itself from nothing. Does this even make sense? William Lane Craig writes, “…if prior to the existence of the universe, there was absolutely nothing–no God, no space, no time–how could the universe possibly have come to exist?” This is an extremely important question for the atheist to answer. Most often, however, atheists have instead changed the meaning of “nothing” to mean quantum vacuum or some other physical reality. This is hardly “nothing” that would have existed before the universe. Before the universe, there was no space, no time, no anything. [Victor Stenger] begins by utterly confusing the pre-creation ‘nothing’ that lies outside of space-time with the ‘nothing’ of a vacuum within space-time. Next, without making it clear which ‘nothing’ he is talking about, he claims that ‘the transition from nothing to something is a natural one, not requiring any agent.’ (Andrews, 97, cited below). The problem isn’t solved when one lends it the idea of a multiverse, either. 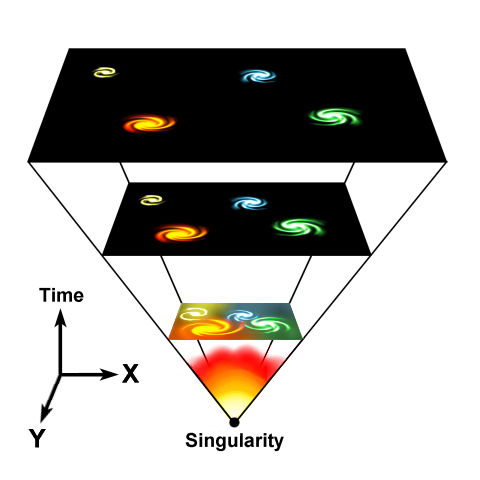 Oscillating universe models still imply a finite beginning (Gordon, 86ff). The idea that an infinite number of universes caused each other in a causal loop does no better–it leads only to a vicious regress. Ultimately, such proposals must be rejected for what they are–fiction. First, as in all scientific (and otherwise) inquiry, once one has reached the best possible explanation for an event, one has reached the end of the inquiry. An inference to the best explanation does not require an explanation of that explanation. There’s a reason that scientific inquiry can appeal to laws: they best explain how the world works. Second, the first part of the Kalam is that “Everything which begins to exist has a cause” not “Everything is caused.” The atheist has merely misread or misinterpreted this principle. Should the atheist want to press the second point–that everything is caused, they have already conceded the weaker principle (that everything which begins has a cause), and they must further argue for a much stronger metaphysical claim. I leave it to the atheist to establish this claim. “But,” the atheist may object, “you’re just denying the antecedent!” Not quite. I’m not saying that God didn’t begin, therefore God was uncaused–rather, I’m arguing that because God did not begin, this argument does not apply to God. There could be other arguments made to establish that God is caused, but to do so would require, as I pointed out, arguing for the metaphysical principle that “everything is caused.” Again, I leave the atheist to make this argument. While many objections to the Kalam might be made in good faith, it is clear upon examination that they all fall far short of defeating the argument. The Kalam Cosmological Argument succeeds in its goal: to show that the universe is caused. What is this cause? That’s a question we must all consider with fear and trembling. Those interested in a broad outline of the Kalam Cosmological Argument can read my post on the topic. For a discussion of one both Richard Dawkins’ and Graham Oppy’s objections to the Kalam, read Dawkins and Oppy vs. Theism: Defending the Kalam Cosmological Argument. Edgar Andrews, Who Made God (Darlington, England: EP books, 2009). Reviewed here. Bruce Gordon, “Inflationary Cosmology and the String Multiverse” in New Proofs for the Existence of God by Robert Spitzer (Grand Rapids, MI: William B. Eerdmans, 2010). William Lane Craig and Paul Copan, Creation Out of Nothing (Grand Rapids, MI: Baker, 2004). “[Arguments for God’s existence from an infinite regress] make the entirely unwarranted assumption that God himself is immune to the regress.” -Richard Dawkins, The God Delusion, 101. Dawkins is frequently witty, but often wrong. The argument is for broad theism. The Kalam is intended to show that the universe is caused, it is not an argument for Christianity specifically. I pointed out in another post that just because an argument is for broad theism (or just the brute existence of God), that doesn’t mean the argument is useless evidentially for Christianity. If we know the universe is caused, then we also know whatever caused the universe must be capable of causation (obviously), choice (it must select a moment to bring about the universe), powerful enough to bring the universe into existence out of nothing, etc. This would be powerful evidence and part of a cumulative case towards Christianity. Then there’s Dawkins’ quote in The God Delusion which I have seen utilized to challenge the Kalam. First, I should note that Dawkins’ quote is in response to Aquinas’ Five Ways/Proofs. Further, it seems to be intentionally pointed towards a Leibnizian version of the Cosmological Argument (for a fuller defense of that argument, see here). But, a simple answer to Dawkins objection, which he seems to think is devastating, would be to point out that the universe and God are different types of entities. The universe is contingent, and God is necessary. That’s not arbitrary, that’s just the kind of things those entities are. Not all atheists are as capable of blind, willful ignorance as Dawkins. Graham Oppy’s recent book Arguing About Gods has a thoughtful, challenging section dedicated to William Lane Craig’s exposition of the Kalam. Oppy challenges Craig on every step of the Kalam, but I’m going to focus upon one. Oppy writes, “[I]t is quite unclear why one should suppose that the allegedly counter-intuitive behavior of the transfinite [numbers]… casts doubt on the idea that the very smallest transfinite cardinals do find application to ‘the real world'”(Arguing About Gods, 140). Yet Oppy provides no reason to think that there are actually infinite things found in reality. Rather, he resorts to claiming that Craig misinterpreted Hilbert’s paradoxes and that “If the Cantorian theory of the transfinite numbers is intelligible, then we can suppose that some parts of it find application ‘in the real world…'” (Oppy, 140). But is that true? Aren’t there plenty of things that are intelligible but for which we have no application ‘in the real world’? I abstract a bit when I point this out, but it is perfectly intelligible that there could be flying pigs, yet we don’t find an application of that in “the real world” other than as a false statement. There are nearly limitless examples of intelligible things we can think of, or intelligible theories, which have no application in the real world. But perhaps Oppy isn’t making a claim quite as strong as saying actual infinites exist. Perhaps he is just referring to the possibility that they do. The problem then, however, is that, as Craig writes in a critique of Oppy’s position, “Oppy’s attempt to defend the possibility of the existence of an actual infinite is vitiated by his conflation of narrowly and broadly logical possibility.” The problem is that Oppy has confused broad logical possibility (that it is possible to construct a consistent set with an actual infinite) with modal (the notion that an infinite actually does exist in a possible world) or actual possibility in the real world. Again, Craig writes, ” Oppy… seems to take a proposition’s freedom from inconsistency in first-order logic to be indicative of that proposition’s being true in some possible world” (Craig b, cited below). So Oppy has not done anything to defeat the Kalam. Even were Craig to grant that Cantorian theory allows for broad logical possibility of actual infinites, it would not show that they are actually possible in our world. And again, even were they possible in the real world, an actual infinite would have to exist in order to discredit the Kalam. Thus, Oppy’s counter to the Kalam is quite weak–it’s based upon a conflation of broadly logical and actual possibility, and even were he to show that infinites are actually possible, the problem would remain that we have observed none. Yet, and this is very important to note, even if actual infinites did exist, that wouldn’t undermine the idea that everything which began has a cause. It would only allow atheists to claim the universe did not begin. But how would they go about claiming that? They’d have to show that a model of the origins of the universe which allowed for an infinite past was plausible–more plausible than the alternative. Yet the only hope for showing this would be to make a theory as parsimonious as the Big Bang theory, which postulates an absolute beginning to the universe. So, even were there actually infinite things in the universe, which I very much doubt, that would not undermine the Kalam. It would make the argument more difficult to defend, but it would not falsify it. All it would show is that there are objects which are not caused. Thus, I take it that the Kalam Cosmological Argument does not suffer defeat, either from vocal, misguided atheists like Dawkins, or thoughtful philosophers like Graham Oppy. 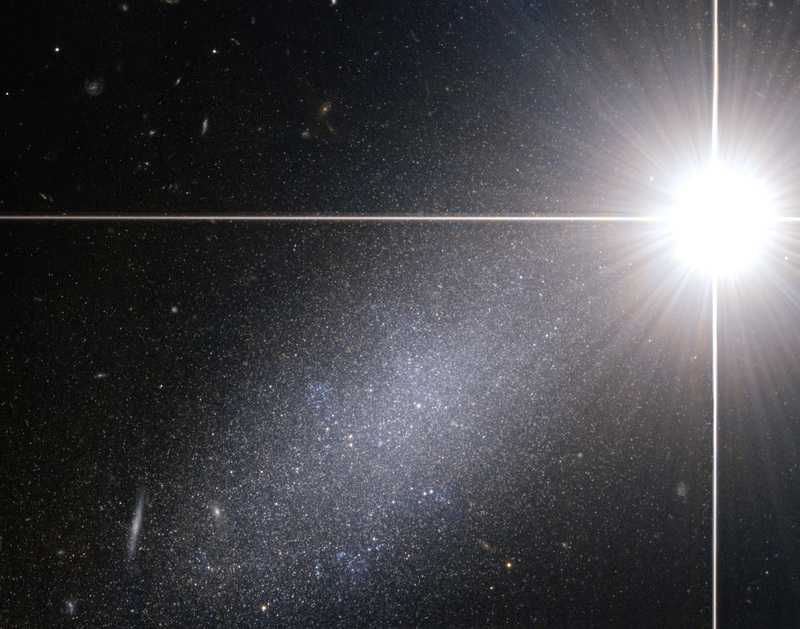 Again, see an outline and defense of the Kalam Cosmological Arugment here. William Lane Craig discusses another objection: whether a beginningless past is actually infinite: here. He offers a number of critiques of Oppy’s position here. You can also access a review by Craig of Oppy’s book here (you will need to sign up for a free account on http://www.reasonablefaith.org/). Graham Oppy, Arguing About Gods (New York, NY: Cambridge, 2006). Richard Dawkins, The God Delusion (New York, NY: Houghton Mifflin, 2008). William Lane Craig, The Kalam Cosmological Argument (Eugene, OR: Wipf and Stock, 1979). William Lane Craig b, “Graham Oppy on the Kalam Cosmological Argument” (Leadership U, November 8, 2005), http://www.leaderu.com/offices/billcraig/docs/oppy.html, accessed 9/1/2011. Also found at http://www.reasonablefaith.org/site/News2?page=NewsArticle&id=5162. 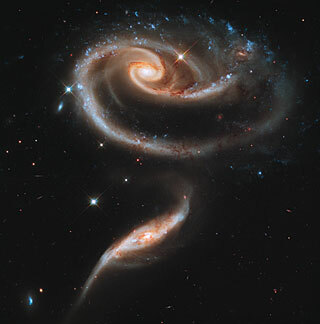 Image credit: ESA/Hubble and NASA: http://spacetelescope.org/images/potw1021a/, found at http://commons.wikimedia.org/wiki/File:PGC_39058.jpg. One of the most frequently cited and debated arguments for the existence of God is the Kalam Cosmological Argument. I have not written on the argument before because there is simply so much good material on it out there that I don’t think I can add anything new. I have, however, run into numerous people with questions on the argument recently, and felt the need to finally get around to a post on the Kalam. Those interested in the argument are highly encouraged to read the links included at the end. The argument is deductively valid, so the question is whether the premises are true. If true, the conclusion is certain. Suppose premise 1 were false. In that case, things could and would be coming into existence for no reason whatsoever out of nothing. We would observe a remarkably different universe than that which we do, in fact, observe. A tiger would miraculously materialize in my room and eat me. Now, it must be noted that some appeal to quantum physics in order to say this premise is false. They hold that certain quantum events bring things into existence without reason. Such an interpretation seems misguided at best, however, for a few reasons. First, the event would seem to have an explanation, namely, that it is a quantum phenomena of type x. Second, even were one to deny that this is a form of explanation or causation, the fact remains that these quantum events don’t originate from nothing. They originate from the laws and systems present within our universe. Third, these quantum events, on an examination of quantum theory, are not uncaused; they are merely spheres of probability. Finally, an exclusion of causal chains seems to undermine quantum theory itself or at least make it difficult to correctly interpret (on this, see William Wharton’s paper “Causation with Quantum Mechanics”). Like Wharton, I think the main reason causation is sometimes excluded from interpretations of QM is because of an avoidance of “metaphysical first causes.” Obviously, if this is the motivation for avoiding causation, it is not spurred by a commitment to science, but a commitment to avoiding the metaphysical implications of science. First, quantum mechanics is not going to save the atheist here. In QM, virtual particles come into being in a vacuum. The vacuum is sparked by a scientist. The particles exist for a period of time inversely proportional to their mass. But in the case of the big bang, there is no vacuum – there’s nothing. There is no scientist – there’s nothing. And the universe is far too massive to last 14 billion years as a virtual particle. (Wintery Knight, “How to defend the kalam cosmological argument just like William Lane Craig” April 8th, 2009). The quantum events observed are caused: by the scientist. Therefore, they don’t undermine premise 1. To sum up, the reasons for thinking the first premise true are clear: 1) to deny it undercuts science; 2) we don’t observe a universe with uncaused events; 3) the only reason found to deny the premise is an a priori commitment to anti-theism. Did the universe begin? There are many arguments to support the premise that the universe did, in fact, begin, but I’m going to focus on only two: the impossibility of an infinite past and the empirical evidence of a finite past. If the past is infinite, then we will have had to cross an infinite number of moments of time in order to come to the present moment. However, for any finite number of moments in time, x, there will always be a moment such that x+1 does not equal infinity. There is no way to start at any arbitrary moment in the supposedly infinite past and then add enough successive moments to arrive at the present moment. As such, it would be impossible to experience the present moment. However, we are experiencing the present moment, therefore, the past is finite. Despite misgivings from some Christians about the Big Bang theory, it has proven to be eminently valuable for arguments like the Kalam. I would go so far as to say the Big Bang serves as powerful evidence for a creator. The reasoning behind this is that when we measure cosmic background radiation we can measure the expansion of the universe. Extrapolating backwards leads us to the conclusion that at some point in the finite past, the universe began to exist. Therefore, it is reasonable to conclude that both premise 1 and 2 are true. However, because the argument is deductively valid, it follows that the universe has a cause. Okay, so the universe has a cause. That doesn’t prove God exists! Well no, it doesn’t, but it does show that whatever caused the universe has many of the attributes classical theism has attributed to God, and therefore lends credence to the claim God exists. 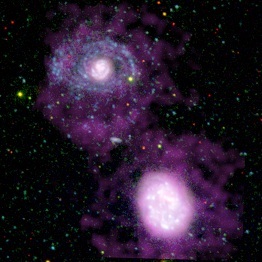 For whatever caused the universe must have extraordinary power (omnipotence); it must have made a choice to create the universe out of nothing (personal causation/agency); it must have been outside of time (the universe came into existence along with space and time); it must have been outside of space; and it must exist necessarily. As such, the Kalam doesn’t prove Christianity true instantly; it just proves theism is more plausible than atheism. Not only that, but it does show that whatever caused the universe is remarkably similar to the God Christians claim exists. Perhaps the most common objection to the argument outlined above is “Okay, well who made God?” This common retort can be answered after a minute of reflection. Classical theism holds that God exists necessarily, which means that God is eternal and beginningless. The first premise asserts that “whatever begins to exist…” therefore, it doesn’t apply to God. Is this a mere ad hoc fix on theism? No, because it isn’t saying God has no explanation for His existence (which reason is found in His necessary existence); it is saying that he did not begin, and is therefore uncaused. The detractor at this point would have to establish that “everything which exists is caused”–a much more difficult claim to defend than the claim that “everything which began to exist has a cause.” In fact, the anti-theistic claim seems necessarily false, for things which don’t begin are uncaused. Did the multiverse create itself? Who made God?– more objections to the KCA are answered. Recently, the need for defending Christianity in a short time period has come to light. I was in a discussion with some acquaintances and was asked to outline why I believe what I believe, but we were on a time crunch so I only had about 15 minutes. Thankfully, I have had access to some wonderful resources that allowed me to memorize some quick, but useful arguments. This post is intended to provide other Christians with a case for their beliefs that they can memorize and share with others. Note that the study cannot stop here. Most people will not be convinced by the basics outlined here. The goal of this post is to provide a springboard for discussion and keep people engaged in the idea that God exists and Jesus is Lord. Each section is intended to flow directly into the next. I encourage my fellow Christians to memorize a “case for faith” in a manner like this, so they may be prepared with a reason for the hope within them (1 Peter 3:15). The arguments are necessarily short and simple due to time constraints, but they offer a short defense that will, hopefully, spur further conversation (again, don’t forget to do more research!). Greg Koukl says we don’t need to convince someone right away–we just need to “put a rock in their shoe” so that we can keep the discussion going later. As always, the most effective apologetic is a prayerful, Christ-reflecting life. 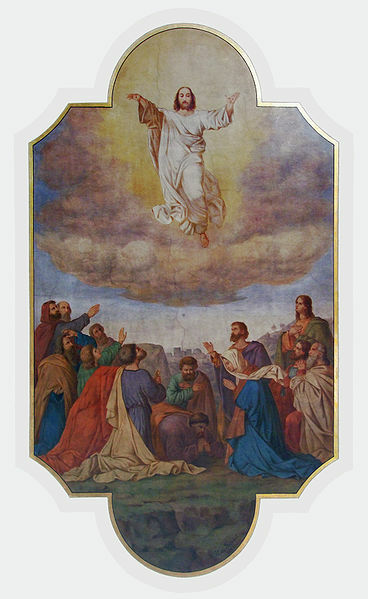 May the Holy Spirit guide you all. “Objective moral values” here means that moral values are true regardless of what anyone thinks. For example, “murder is wrong” would be wrong even if every single human being thought murder was the way to achieve greatest happiness and encouraged it as an extracurricular activity for teenagers. But the only way to hold that objective moral values exist is to grant God’s existence, because objective laws require an objective lawgiver. 2) Even among theistic religions, there are contradictory claims (Christianity: Jesus is God; Judaism: Jesus is not God; Islam: Mohammed is prophet; Christianity: Mohammed is not a prophet; Judaism: Mohammed is not a prophet; Islam: Jesus is not God; etc.). 3) The Law of Noncontradiction (actual contradictions like “square circles” or “married bachelors” cannot exist and are not real) shows us that therefore, these religions cannot all be true. 2) Jesus made divine claims “I and the Father are one” John 10:30; “Before Abraham was, I am” John 8:58; etc. 3) The miracle of the resurrection is God’s confirmation of Jesus’ divine claims. If the Gospels are reliable (per 1), then Jesus is divine. There is good evidence to think that God exists. There are even other arguments that could be presented, such as the teleological, ontological, transcendental, argument from religious experience, and more. We can also see that not all religions can be true. Furthermore, there are good reasons to think the Gospels are reliable and that Jesus claimed to be God and had His claims authenticated by God Himself in Jesus’ resurrection. Remember, this is not even close to a full defense of Christianity. It is simply a condensed, easy to remember defense designed to be ready at a moment’s notice for when the Holy Spirit leads people into our paths. We need to do more research, offer more arguments, and continue to witness as the Holy Spirit works through our testimony. This defense is by no means a total apologetic; it is meant only as an introduction to spur further conversation. Always have a reason. Some have objected to this post on various grounds, most of which are reducible to my arguments not being developed enough. I emphasize once more, this is supposed to be used for a 15-minute defense of the faith, not an entire survey of the field. See my links for more reading, and continue to investigate for yourself. The Leibnizian Cosmological Argument (not developed in this post). 2) On Guard by William Lane Craig- a basic level introduction to many of the ideas discussed here. 3) The Case for Christ by Lee Strobel-a wonderful book which goes through many issues of historical Christianity. Presents evidence for the historicity of the Gospels and the divinity of Jesus. 4) Mere Christianity by C.S. Lewis-a Christian classic, this work is a fantastic defense of Christianity. C.S. Lewis is a masterful writer and I highly recommend this work. 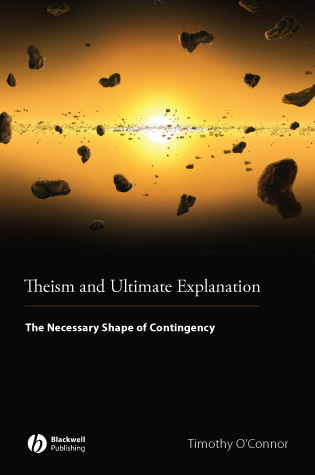 Timothy O’Connor’s brief Theism and Ultimate Explanation has already garnered much discussion since its publication in 2008. Notably, the most recent edition of Philosophia Christi features a book symposium on the work. What is all the fuss about? Part I contains some fantastic arguments. O’Connor outlines various views on modality and seeks to defend modal realism, which takes modal truths to be actual truths about our world (and other worlds). Further, he defends the possibility of a priori truths against attacks from those who argue that all such truths need to be established empirically. There are some who argue that empirical evidence (such as quantum mechanics) helps to undermine belief in some methods of reasoning, such as the law of non-contradiction, but O’Connor counters this by pointing out that those who make the argument that the “odd” data which may seem to contradict the method of reasoning against which their argument is directed are using the very methods of reasoning which they are trying to undermine. Another possibility is that the empiricist making this claim has switched to a different method of reasoning in order to critique that which holds to things like the law of non-contradiction, but O’Connor points out that a critique from such a method is “underwhelming” at best (46). In Part II, O’Connor argues that it is coherent to ask the question, “Why is there anything (contingent) at all?” (65). He further argues that the only possible answer to this question is a termination in a necessary being. “If the universe truly is contingent, the obtaining of certain fundamental facts or other will be unexplained within empirical theory, whatever the topological structure of contingent reality… it will have to ground in some way… in a necessary being, something which has the reason for its existence within its own nature” (76). He then turns to the question of what the nature of that necessary being may be, by examining two possibilities: “chaos” and “logos“. Logos is the view which calls the necessary being God, whilst chaos argues that it is a random being or a brute fact. O’Connor argues that logos is the most rational view to hold. Finally, in chapter 6, O’Connor turns to theological reflections on the argument thus far. He argues that the concept of an immutable, timeless being seems contradictory to things like the trinity, but maintains that a less restricted of both of these views is plausible. He argues against molinism briefly, by stating that the counterfactuals involved would have no truthmakers. O’Connor’s book weighs in at about 144 pages of text, but he makes use of every word. My biggest complaint about the book is how short it is. Often, it seems as though O’Connor simply doesn’t take the time to address the issues he is discussing in enough detail. Part I and the argument for the necessary being do seem to be adequately established, but chapter 6 in particular doesn’t do justice to opposing views. For example, the molinist could respond to O’Connor’s argument by saying that the “truthmaker” of such counterfactuals is simply existence in the mind of God. This could lead to an argument for determinism on molinism, but then the molinist could point to the distinction between de re and de dicto necessity. The arguments leveled against a timeless deity or an immutable one suffer similarly from limitations of space. I think O’Connor should have used the space of this chapter to expand the other ideas already present in his work. As it stands, Theism and Ultimate Explanation is a fantastic work which is great reading for the philosopher of religion. It can be finished in one sitting, but the ideas therein will keep readers contemplating the work for quite a while afterwards. It comes recommended, but with the stipulation that readers may be left wanting more. One of my personal favorite areas of philosophy of religion is studying the arguments for existence of God. 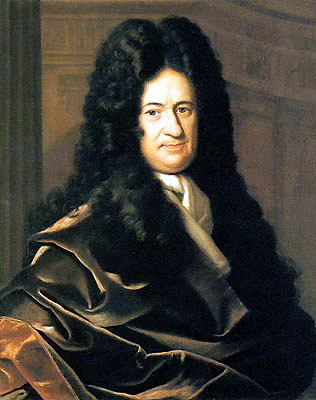 One type of argument for God is the Cosmological Argument, and one of these arguments was developed by Gottfried Wilhelm Leibniz. I’m content with settling for the conclusion found in 6). Demonstrating that an external, necessary entity caused the universe is as close as to God as many arguments can go. A being which causes the universe would obviously be exceedingly powerful, the argument itself states it is transcendent to the universe, and the being exists necessarily. Many (most?) theists tend to agree that the other attributes Classical Theism has generally assigned to God follow quite easily from the acknowledgement that such a being exists. The question must now turn towards reasons why we should believe that this valid argument is true. 1) seems as though it should be accepted simply as a given. I don’t think I should need to defend 1). If we abandon the idea that everything which exists has an explanation (either contingently–from something outside of itself, or necessarily–from its own necessity), then we should expect any number of utterly random things to pop into and out of existence for no reason whatsoever! After all, it would be the height of self-delusion to think that, while all things require reasons to exist, it just so happens (how fortuitously!) that our universe is the only thing which exists for no reason. I’ll leave it at that for now… such ideas are more important for the Transcendental Argument, after all. 2) simply doesn’t need a defense. Step 3) is alongside step 1) as the only two premises which are capable of being denied (for 2 is, again, obvious, and 4) follows simply from the first 3; we will discuss step 5 shortly) to avoid the conclusion. Denying step 1), I think, is clearly unacceptable, so denying step 3) is really the only way to go for the anti-theist. But what reasons do we have for thinking the universe exists necessarily? I think this is patently not the case. After all, everything which exists necessarily exists (necessarily) forever! Therefore, a necessary universe must have existed for an infinite amount of time (for time is part of the universe). But if this is the case, we run into the insurmountable problems which an infinite past brings up (these problems are also important for the Kalam Cosmological Argument). I’ll pick just one problem to demonstrate: if the past is actually infinite (as it must be, granting a necessary universe), then we could never get to the present moment, for we would have had to traverse an actually infinite amount of time to get here! Not only that, but as time passes, there is no time being “added” to what came before. Infinity is infinity and it cannot be increased by adding to it or decreased from taking away from it. Therefore, every second which seems as though it is lengthening our lives is actually not doing anything of the sort, despite every commonsense notion with which we have lived out whole lives saying otherwise! The universe, on this view, is a deceptive place, in which nothing is as it seems. Not only that, but if the universe were necessary, then it seems as though hard determinism–that is, the view that there is no freedom of the will whatsoever–must be the case. For, if the universe exists necessarily, then it has possessed all of its parts necessarily, forever. Furthermore, there doesn’t seem to be any reason as to why the universe could not have been different. To assert the universe exists necessarily, once again, means to assert that no part of the universe could have failed to exist. Think of it this way: the universe in which I ate breakfast this morning (as opposed to this universe, in which I did not [shame on me, I know]) is logically impossible. Why? Because things which exist necessarily cannot change! Worse yet, the explanation of a necessary universe leads to the question of why exactly everything is as it is. The anti-theistic view of such a universe is that, necessarily, the universe exists as it does, which happens to have an extraordinary amount of order, laws of nature which happen to allow for life, etc. (this objection was brought to my attention through Stephen Parrish’s God and Necessity, 241). Thus, even if we grant that it is possible the universe exists necessarily, the individual properties of the universe still call out for explanation: why is it that the universal constants are what they are, and don’t deviate by the infinitesimal amount which would have prevented the existence of life? Ultimately, then, the necessary universe theory falls victim not just to objections against the idea of a necessary universe, but it also falls victim to the objections against the universe existing for no reasons whatsoever. This means that we have established 1-4. Step 5 is an axiom which I have proposed, because it seems to me quite clear that an infinite regress of contingent causes is a vicious regress–an impossibility. Everything in such a chain would have to, by 1), have a cause outside of itself. If we take C1 to be caused by C2, but both are contingent, then C2 calls for an explanation, C3, which calls for C4, which calls for C5… ad infinitum. I don’t see any reason to deny that this regress is vicious. Thus, 1-5 have been established. If this is the case, however, then 6 follows, simply because at some point the series of causes C1…C5… would have to be terminated in N1 (a necessary cause). Furthermore, this cause would be external to the universe, from step 1). Thus, the Leibnizian Cosmological argument provides us with powerful reasons to think that a transcendent, powerful, necessary entity brought the universe into existence. I don’t see any reason to call this entity anything but God. There are many reasons to think that an entity with these properties (namely, necessary existence, transcendence, omnipotence) would possess many or all the other properties generally assigned to God. Craig, William Lane. On Guard. David C. Cook Publishers. 2010. Parrish, Stephen. God and Necessity. University Press of America. 1997.